The concrete is manufactured using cement, sand, gravel and water as the main components materials. The active material in concrete is cement which binds other materials physically and chemically with water and solidifies. Sometimes admixtures are used in concrete to enhance its properties. There are various types of cements used for manufacture of concrete, but most commonly Portland cement is used. 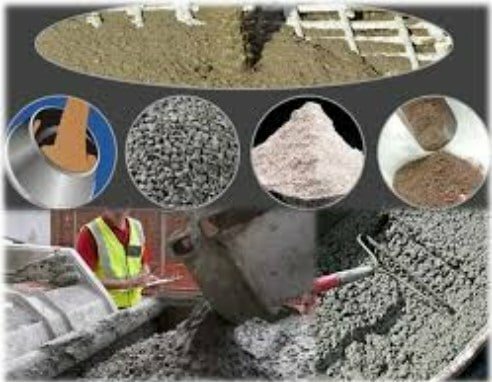 Each type of cement provides different properties to concrete. Limestone and clay are used for manufacture of cement. The type and quality of aggregates to produce concrete varies based on the purpose of construction. The shape, size, grain, density and grading of aggregates etc. all affects the workability, durability and strength of concrete. The aggregates are classified as fine aggregates (sands) and coarse aggregates (gravel). It is best to say that water suitable for drinking is used for concrete production and construction. The water used for concrete should be clean and free from vegetation, deleterious matter and acids. Admixtures are used in concrete to modify properties of normal concrete to suit the requirements as per construction design.